Most people would define Data as measurements, numbers or results of tests, events, transactions or other activities stored in logs, spreadsheets and records. Data can also reside electronically in Equipment and Systems memories. There it stays unless we do something. We might transform the Data into a Table or better still into Graphical format to establish the ‘so what’ or analysis from the Data. From this we can produce Information in the form of summaries, trends, risk and criticality assessments, patterns, etc that we use to visualise how a process performs or not. We can also establish conformance or not with customer requirements. Knowledge is the subsequent intelligent and value added use of this Information to make decisions to correct or improve process performance. These decisions can relate to cause and effect relationships, implementation of corrective and preventative actions and the application of lessons learnt. Ultimately this Knowledge is used to help us manage our resources and business in a more effective and efficient manner. This on-going deployment of Knowledge is critical and needs to be viewed by all in the Organisation as of equal value to any other business asset such as equipment and facilities. 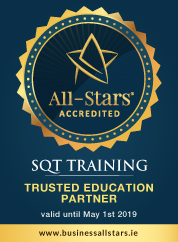 From a Lean Six Sigma perspective, SQT are at pains to highlight to Client Companies the value of having a Knowledge Database where all Projects are archived on successful completion. This is to ensure this Knowledge is shared to avoid reinventing the wheel and ensure that others undertaking similar Projects will have a template and recommended approach to follow….i.e. using the DMAIC to convert Data to Information to Knowledge in order to improve Processes and reduce costs!